Updating your look is not always about what’s in your wardrobe or what’s new for the season ahead. 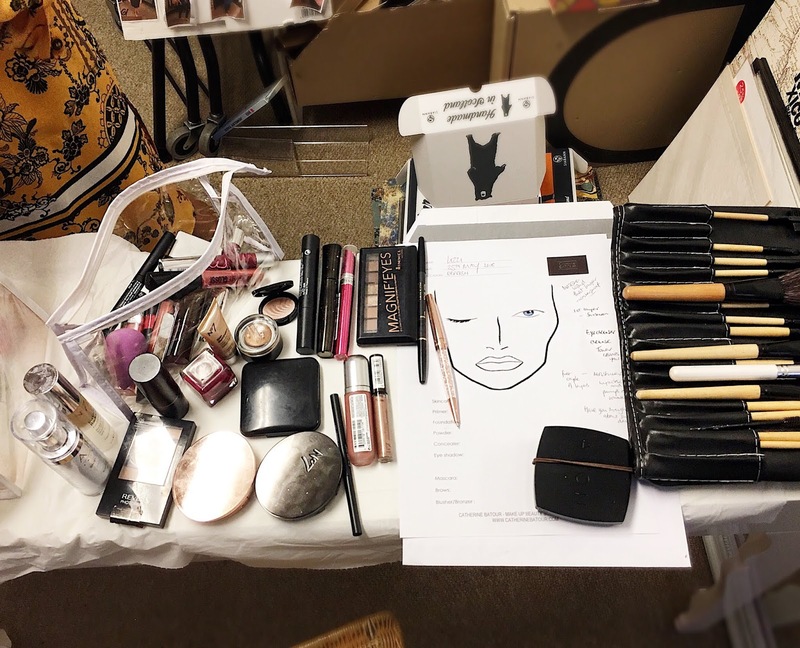 Unless you are super crazy about make up, then I think at times we can all be guilty of wearing the same make up, day in, day out – because it’s easy. I for one struggle in this area, I have about 2-3 lipsticks that I go to, I wear the same blusher every day and I’m too lazy to put on eye make up. I have days where I think “I’ll just do my base and put a bit of lip gloss on, and that will do” – does this sound like you too? 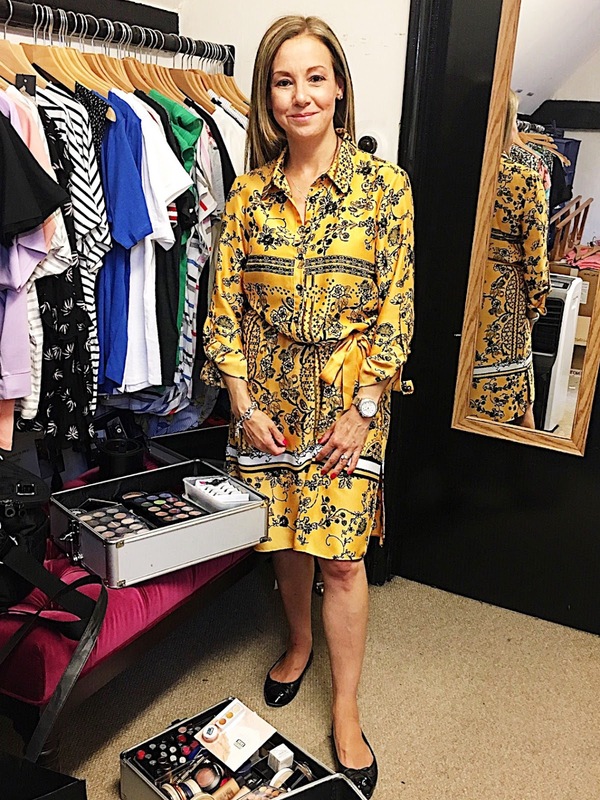 I met Catherine Batour recently at a Chloe James Lifestyle Fashion Show in St Albans; Catherine was working as the make up artist for all the models, and I was helping out as a dresser for Mel Wall, a stylist who was modelling at the fashion show. All the models looked fabulous in what they were wearing, but I couldn’t help but notice just how lovely their make up was too; the models had their make up to suit their colourings and their face – it made me feel like I had no make up on at all (and if I’m honest, I probably just had my base on with a bit of lippy) So it’s time to step up my game. And so a make up lesson I booked with Catherine Batour soon after this event. And it’s this, my own make up lesson that I’m going to take you through. Now Catherine will come to your home but for reasons I won’t bore you with, we held the session in a room at Chloe James Lifestyle Boutique (Thank you Donna!). Let’s start with me, how did I look when I arrived? Well I thought I had make up on, I had even made ‘an effort’ to arrive in my best (*slot in emoji of monkey with hand over eyes here). But once I took these photos, you can see I look like I’m not wearing any at all! How do I feel about make up? I want to wear it, but I don’t have time for it? I’m not a big spender on make up and I wear the same products day in, day out. I also want to make myself look my age. (What? I hear you say – bear with me here and let me explain). It’s all very lovely having compliments that I look younger than my years, and yes on a Saturday night out that’s exactly what I want to hear. But in a professional environment, I want to look my age, I have earned my 20 years+ career, and I want people to acknowledge my experience, and so if people think I’m 5-8 years younger, where does that leave me? What do I want from the session? I want to still look natural. I don’t want to be wearing lots of colourful make-up, I just want to enhance my own natural style. Plus, I have a lot of red on my nose and cheeks, and I apply lots of foundation to try to cover this up and within an hour you can see it again. I also have dark inner eye circle, right in the corner of my eye on my nose, and so I would like to even that out. I also own a lot of make up, either bought for me or I have got them in gift bags etc, and I just don’t use them, but I appear to be a big collector, I simply don’t throw it away! I own quite a few items from No.7 which is the make up I purchased back in March; No.7 Instant Radiance Foundation – here Catherine quickly pointed out to me that in the short time I’ve owned it, I’ve got through far too much of it, so I’m either applying too much (yep) or I take too much out of the bottle and then not use it (and yep!). No.7 Beautiful Eyebrow Kit – which I’ve not been that happy with because it doesn’t last all day like the L’Oreal product I used to own, and once we chatted it through it seems the wax is just making it slide off. My No.7 Shimmer Palette – which I love, along with my Avon Luminous Blush, a mascara (I’m not brand loyal, it’s whatever I’ve received free or buy cheaply as I discard every 3 months). And that’s it! As you can see I need a bigger make up bag for the items I own but don’t use compared to the tiny daily make up bag I do. I think one of my apprehensions before my lesson (and I didn’t say to Catherine) was that I thought I would leave my session with a long list of products to buy or to be convinced into buying more product in my session to sit along side all this other product. Well fear not, Catherine doesn’t sell any products (she does recommend a variety of brands, but you need that advice anyway – as I don’t have a clue!). I left my session with a list of four items I need to purchase and one of them was a brush! I was truly happy with this. So you see, I already have the products, I just need to start applying them to my face! (LOL) and this leads me nicely on to the next part of the lesson. So before we even touched on how to apply what I need, Catherine talked me through daily hygiene of using my kit. Ever wonder why you might have spots around your chin or on your forehead – it could simply be not cleaning items before they touch your face, and this is just not make up, think about your phone and your hands too. Catherine explained about cleaning your brushes and also your face cloths as well as (and I never truly thought about this) but using antiseptic wipes to clean the outside of your make up cases and bottles, as you pick them up too and then put your fingers on your face. Catherine has written a great blog herself on this, well worth a read and it also takes you through the how to understand how long you should keep your products. Simple click here for it. Here Catherine talked me through applying skincare and how to apply it correctly, getting the order right (particularly over the age of 40) can help plump up your skin and make it look really fresh. Plus the importance of face powder after you’ve applied your foundation. Because I like a dewy look, I skip this step, and it’s that reason why my make up doesn’t last as long, as I’ve not set it properly. To create this base, we’ve evened out the red of my cheeks and nose by using MAC Prep & Prime Colour Correcting – ADJUST, which Catherine has found works on the majority of people, when I bought mine yesterday (Westfield Shepherds Bush) there were 3-4 versions, so ask in store for the right one for you. Now for the dark areas in my eye socket, this can be really dark at times, Catherine explained that people fail to use more than one colour concealer. It seems throughout the year we need different shades as our face colour changes depending on time of year, plus to get good coverage you should consider using at least two to help blend it to achieve an even tone. Specifically for my dark areas, to equalise the blue, I actually need to apply orange! Catherine recommends NARS and Laura Mercier as great concealer brands; she also explained that the more premium the concealer the quicker it drys, and so some people who are new to concealer perhaps do not act very quickly and then struggle to put it on to get good coverage – if this is you go for a concealer that’s a little more fluid until you get the right technique. An area I was completely avoiding! Apart from my eyebrows, I really just didn’t know what to do here. Sticking with various shades of creams and browns, Catherine Batour talked me through selecting three colours for day that were at the lighter shade of the palette and then up’ing it to three darker shades for the evening. The one thing Catherine really understood was my need to turn my day look into evening straight from work without the luxury of going home and refreshing the entire look. So by having an eye palette with about eight shades of similar colours (which it seemed I already owned?!) I could easily do this. The technique is to reapply on top of my day eyes, with three darker shades to create a more smokey eye, and then turn up the dial on eye liner to create this look. I’m a little heavy handed on the blusher it seems, and so we had to tone this down, I think I was using blusher in this way to balance out that I didn’t apply make up to my eyes. So for a Day Look it’s important to get the right balance, and this was the final result which I was very happy with! And then with a slightly smoker eye and a deeper lipstick, this elevates my day to evening without having to do much work at all! This is the difference between my original day look and my new day look as inspired by Catherine Batour – I cannot believe just a few tweaks have really enhanced my look, and I still look like me. I can also confirm none of it came off a few hours later, so I’m truly happy with this. Just because your product says SPF 15 or 30 – it may not be protecting your skin from sun damage. It’s important to still wear sunscreen and check that products have UVA and UVB. I loved it! I can highly recommend taking this time and spending just a couple of hours getting hand-ons advice with your own kit. I’m pretty sure I’m not the only one that has lots of product and never use it! We noticed as soon as I completed my day look, I was smiling and I felt so much more confident. I also found after I left Catherine, walking around St Albans, I just felt fabulous! A 1.5 hour session with Catherine Batour is £75, you can add £25 to that and have the session with a friend. Because you are applying the product to yourself you won’t miss out on any ‘me time’ by doing this. And in her own words…. 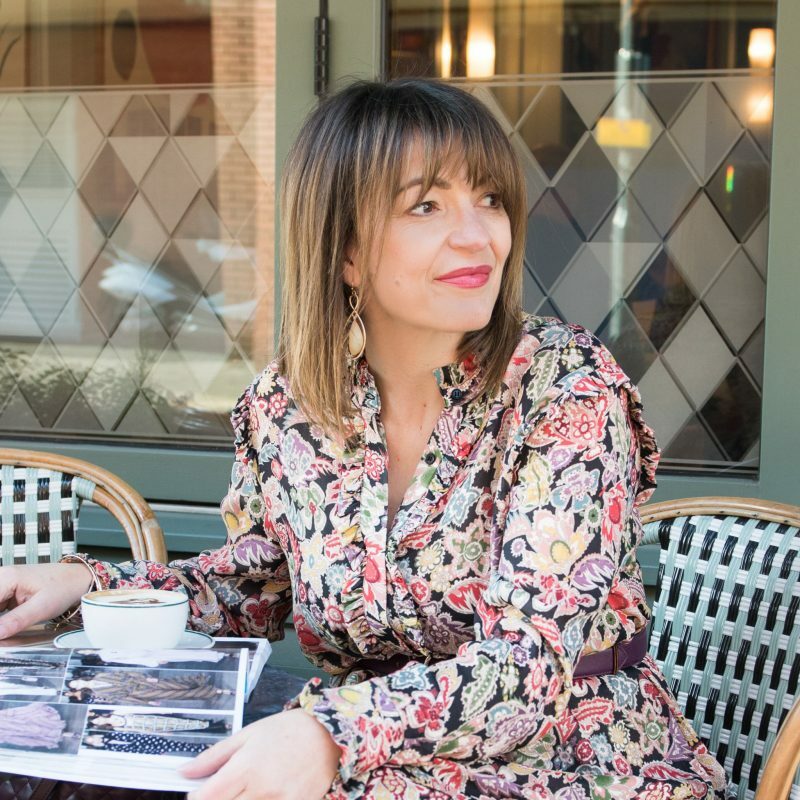 “I started my own business following many years of working in London for Harrods and American Express, with well renowned luxury brands managing VIP clients and luxury partnerships. It is important to look the part and this combined with my love for fashion and beauty has allowed me to run my own business. My business enables me to help others and have a new career around my family life. To find out more simply click here for Catherine Batour’s website. The post MEET CATHERINE BATOUR: MAKE UP ARTIST AND BEAUTICIAN was on Loved by Lizzi first. 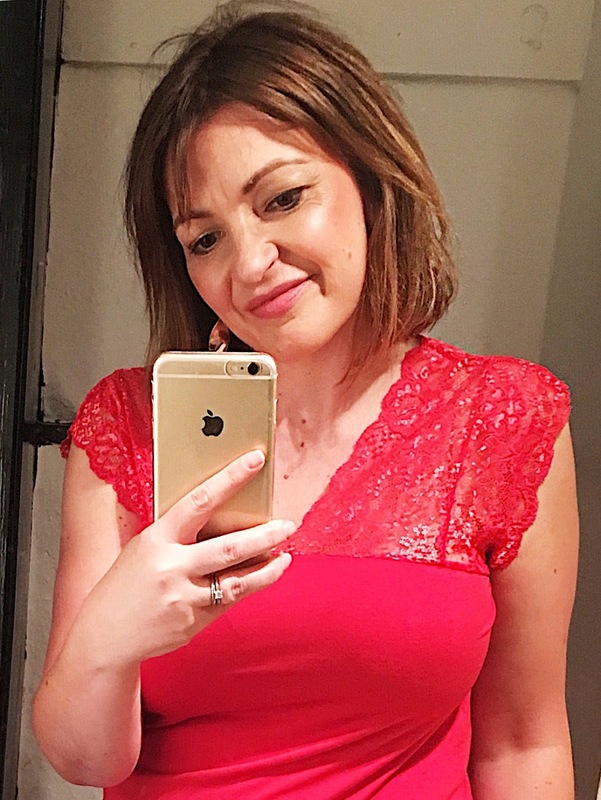 This was taken at Chloe James Lifestyle Boutique straight after the session, the top is Culture Elena Strap, £28.50 available in Black, Navy and Red.